With a 33,000-plus work-force, extensive refining, distribution & marketing infrastructure and advanced R&D facilities, lndianOil plays a significant role in fuelling the socio-economic development of the country. With a mandate to ensure India's energy security and self-sufficiency in refining & marketing of petroleum products, lndianOil has in the past six decades provided energy access to millions of people across the length and breadth of the country through its ever-expanding network of over 47,800 customer touch-points. With a turnover of Rs. 5,06,428 crore and a net profit of Rs. 21,346 crore in 2017-18, and a market capitalisation of 1,71,511 crore, lndianOil is recognised as one of India's most valuable companies . The Company continues to be the largest contributor to the national exchequer in the form of duties and taxes. During the year 2017-18, Rs. 1,90,670 crore was paid to the exchequer as against Rs. 1,79,014 crore paid in the previous year. lndianOil's core business has been refining, transportation and marketing of petroleum products. In line with India's growing energy demand, the Company has over the years expanded its operations across the hydrocarbon value chain - upstream into oil & gas exploration & production and downstream into petrochemicals, besides diversifying into natural gas and alternative energy resources . lndianOil continues to set up state-of-the-art refineries across the country to meet the growing demand for petroleum products. As on 31st March 2018, the Company owns 11 (including two of its subsidiary) of India's 23 refineries with a combined refining capacity of 80.70 MMTPA, accounting for 33% of domestic refining capacity. lndianOil processed 16 new grades of crude oil during 2017- 18, of which 11 were of US origin, in a continuing bid to expand and diversify its sources for imports. Processing of cheaper, heavy & high-TAN as well as high-sulphur grades of crude oil was stepped up for better refining margins. The year 2017-18 marked the commencement of superior BS-VI grade auto fuel supplies from the Company's Mathura and Panipat refineries to the National Capital Territory two years ahead of the scheduled launch across the country by 1st April 2020.
lndianOil operates a network of 14,189 km of cross-country pipelines for transporting crude oil, refined petroleum products and natural gas, with a cumulative throughput capacity of 94.79 MMTPA of oil and 9.5 MMSCMD of gas. During the year, 543 km of new pipeline sections were commissioned. Currently, lndianOil operates six crude oil tank-farms, with individual tank capacities ranging from 30,000 kilolitres (kl) to 85,000 kl, for smooth onward transport to refineries through pipelines. lndianOil owns and operates two SPM (single-point mooring) terminals in the high seas at Vadinar and three SPM terminals at Paradip for anchoring pipeline systems that transfer crude oil from ocean tankers to the tank-farms onshore. Keeping all parts of the vast nation well supplied with essential petroleum products is a 24/7 commitment from lndianOilPeopl.e During the year, lndianOil continued its dominance in the domestic market with a market share of over 44%, covering the entire range of petroleum products from LPG, petrol, diesel, CNG, aviation fuels, lubricants, naphtha, furnace oil, speciality products , etc. The marketing and distribution network was expanded to over 47,800 customer touch points during the year. With retail sales as a key determinant of lndianOil's market leadership, the Company commissioned over 950 fuel stations during the year 2017-18. Its formidable reach into the interior markets is evident from the fact that over 7,500 of its 27,089 fuel stations are Kisan Seva Kendra outlets located in rural areas. lndianOil's lndane brand of LPG cooking gas serves over 12 crore households through over 10,000 distributors . Its 107 aviation fuel stations together refuel over 1,750 flights a day, i.e., more than one flight per minute. The Company is also the market leader in the lubricants business with its SERVO brand maintaining a high market share. It is the Company's constant endeavour to keep in step with the changing customer aspirations, competitive trends and new technologies. lndianOil has been recognised as one of India's top brands by UK-based Brand Finance, an independent consultancy that deals with valuation of brands. It was also voted as India's 'Most Trusted Brand' in the 'Gasoline' category in a Readers' Digest-AC Nielsen survey. lndianOil's R&D Centre, one of Asia's finest, currently has an inventory of over 600 patents . The Centre is expanding its research prowess beyond lubricants and refining technologies to new and emerging areas like bio-fuels, nano-technology, battery storage and other horizon technologies. Technologies developed in-house include the path-breaking INDMAX technology for enhanced LPG yield, which bagged the Excellence Award for Innovation at the World Petroleum Congress in Turkey this year. Petrochemicals is now an integral business driver for lndianOil and has emerged as a major contributor to the Company's bott omline. With domestic capacity falling short of demand and imports taking a significant share of the market currently, growth in petrochemicals demand in the country is set to provide a key demand segment for the Company's refineries in the coming years. Investment in integrated refinery & petrochemicals projects is a compelling strategic choice for the Company. In fact, refining-petrochemicals integration is the way forward for all future refinery expansion plans at lndianOil. Besides offsetting cyclical performance troughs in other segments, this will provide better returns from value addition to refinery product streams and integrated utility management. lndianOil's petrochemicals foray is providing an impetus to creation ofTextiles Parks and Plastics Parks in various regions, each with scope for a wide spectrum of downstream allied industries. Considering this, the Company is envisaging further investment of 30,000 crore in the petrochemicals segment in the next few years. Besides a big share in the domestic market, lndianOil's PROPEL brand of petrochemicals are now exported to 75 countries. Natural gas is fast emerging as a greener choice over other fuels, more so with the Government of India's thrust on a gas-based economy and promoting its use across sectors. lndianOil too has aligned itself to focus on expanding its natural gas business, especially where gas is replacing liquid fuels. lndianOil sources liquefied natural gas (LNG) from international suppliers through long-term contracts as well as spot purchases. The gas parcels are received at the Dahej Terminal of Petronet LNG Ltd., a joint venture of the Company, and supplied through pipelines to large-volume customers located in different locations. At present, lndianOil supplies LNG to 58 institutional customers from fertilisers, power, refining, steel and other industrial sectors. From a modest start in 2004, lndianOil's share in imported gas has grown to an impressive 19% for the year 2017-18. lndianOil LNG Pvt. Ltd., another joint venture with Tamil Nadu Industrial Development Corporation (TIDCO), is setting up a 5- MMTPA LNG terminal at Kamarajar Port in Ennore near Chennai for commissioning in 2018-19. lndianOil is also developing natural gas pipeline networks through joint venture companies, which include at 1,500-km pipeline grid to connect Guwahati to major cities in the Northeast. lndianOil is operating city gas distribution (CGD) networks in eight different geographical areas through JVs. In addition, a CGD project in Udham Singh Nagar was commissioned in May 2018 and projects in two more geographical areas are under implementation. Further, lndianOil has participated in the 9th round of CGD bidding invited by the Petroleum and Natural Gas Regulatory Board (PNGRB). lndianOil's focus on upstream segment has expanded to a portfolio of 19 E&P blocks (9 domestic & 10 overseas) with Participating Interest (Pl) ranging from 3% to 100%. The Company pursues a substantial portion of its E&P activities either in consortium or through joint ventures with national and international oil & gas companies. Its overseas E&P assets are spread over many countries, including UAE, Russia, Oman, Canada, USA and Venezuela. The year 2017-18 marked lndianOil's entry into the highly prospective UAE region with acquisition of 3% Pl in the Lower Zakum, Offshore Abu Dhabi (UAE) asset in consortium with ONGC Videsh Ltd. and Bharat Petro Resources Ltd . The Company also acquired 17% Pl in Mukhaizna Oil Field, a producing field in Oman, in April 2018.
lndianOil registered the highest ever production and sale of explosives and cryogenics during 2017-18 . The Explosives group manufactured and sold 177 thousand metric tonnes (TM1) of explosives during the year, registering a 12% growth over the previous year's volume of 158 TMT. The Cryogenics group sold 28,782 units of cryocans and cryo-vessels during the year as against previous year's sale of 27,694 units. lndianOil has been one of the early investors in renewable energy sources in the country and today boasts of a 200-MW portfolio of wind and solar power capacity, which is being further expanded rapidly. Looking ahead, the Company targets to bring solar power to all its refineries, installations and office buildings in the near future. In addition, the Company is the industry leader in converting the retail network to run on solar energy, with more than one-third of its fuel stations already running on solar energy and the rest to follow soon. The Company is also actively exploring several waste-to-energy options and has commissioned three waste-to-energy plants under Swachh Bharat Abhiyan. In sync with the projected growth in electric mobility, lndianOil is exploring opportunities to manufacture and retail LithiumÂ­ ion batteries. 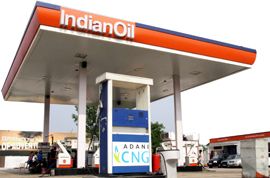 Fast-charging stations are also being planned and five pilot charging stations have been put up at lndianOil fuel stations, one each in Nagpur, Kolkata, New Delhi and two in Hyderabad. lndianOil is determinedly working on making its operations greener and aims to reduce its specific carbon and water footprints by 18% and 20% respectively by the year 2020, with 2012-13 as the base year. As India's flagship public sector energy major, lndianOil operates in one of the biggest and fastest-growing energy markets in the world. The many mega trends shaping the Company's external environment include India's high GDP growth, its growing population and urbanisation; sustainable developmental goals of clean and affordable energy to all; climate change and pollution concerns; global trends by way of growth in LNG trade; shale revolution in the US; rapidly falling costs of renewable energy; rising interest in electric mobility; and consistent improvements in energy efficiency. In the short to medium term, the Company is operating in a milieu that is witnessing a return to steadily rising oil prices, foreign currency fluctuations, heightened air pollution concerns, growing competition in the domestic market, policy objectives focussing on reducing import dependency, increasing energy access , and a growing demand for oil, gas and petrochemicals in the country. An upshot of lndianOil's vision and its pivotal strategy to tackle the challenges and opportunities presented by a dynamic external environment has been growing integration and diversification of operations as well as global reach. Besides, the Company is committed to being a dependable partner in India's growth story with continued investments to enhance its asset base, striving for cost optimisation across the supply chain and making its operations and offerings greener and cleaner. lndianOil has always attempted to fulfill its priorities on the socio-economic front while at the same ensuring sustainable growth and profitability. Besides being at the forefront in implementing key Government initiatives like the Pradhan Mantri Ujjwala Yojana, the Company partners communities in which it works with a comprehensive CSR agenda that focusses on specific areas such as hygiene & sanitation, education & skilling, rural development, environment, sustainability, protection of national heritage and promotion of art & culture.